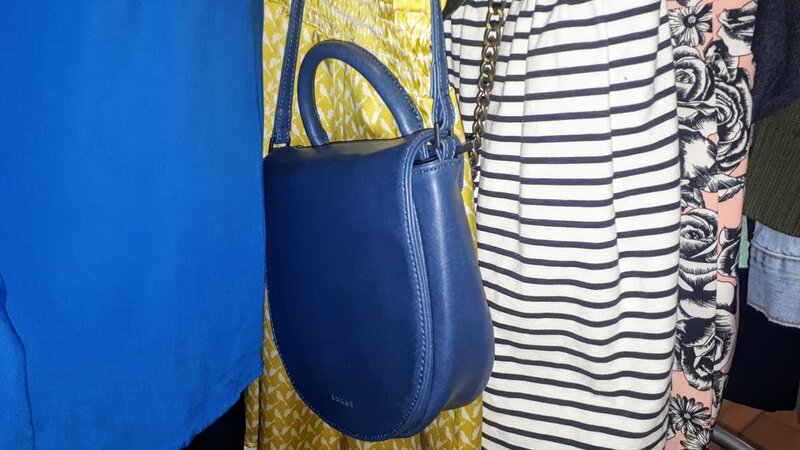 Friends, the shop is busting with purses, special finds and ORANGE! This makes me so happy! If this dress from Hawaii fit me it would so be mine! But I will settle for seeing it on you. I love this length combined with the bright orange for vacation vibes! Actual vintage dress, so, you know, keep away from open flames! The gorgeous hibiscus print could also be a tablecloth or vintage curtains! Friends, I love this print so much I made it my lock screen! We still love overalls, right? Especially space-y overalls like these ones; overalls in the future! Ok, so, this, friends, THIS. 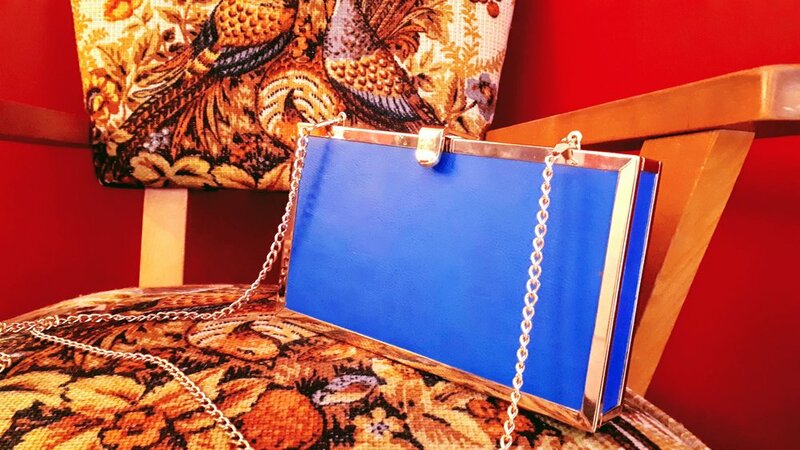 A timeless blue box-purse with a gold chain is an accurate description, but fails to express how NUTS I am for this purse! 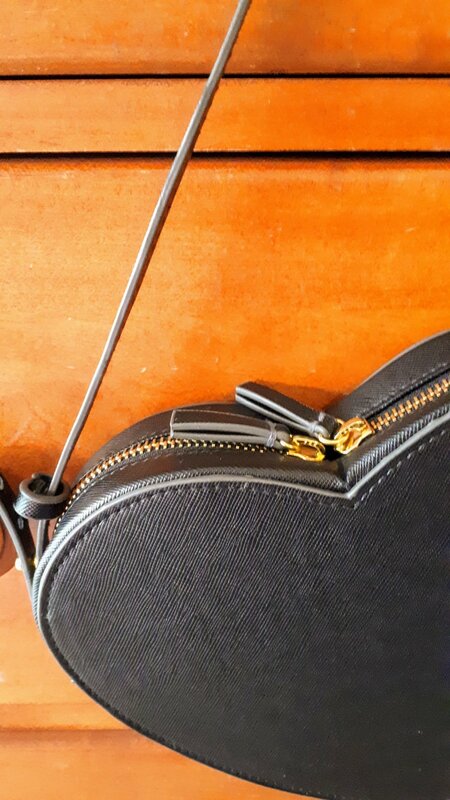 If you want you can also snake the chain inside purse and then….Hey! Who left this *book* laying around? Friends, I JUST CAN’T EVEN I love this thing so much!!!!!!! 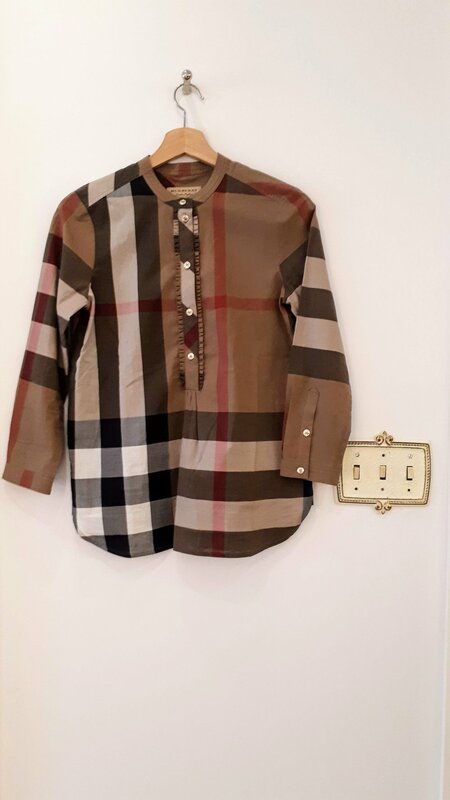 Now, friends, let’s get very serious for this week’s special treat: a Burberry top! Remember this Kate Spade mini-backpack we saw in the backroom a few weeks ago? For a different vintage look, how 90s is this dress? 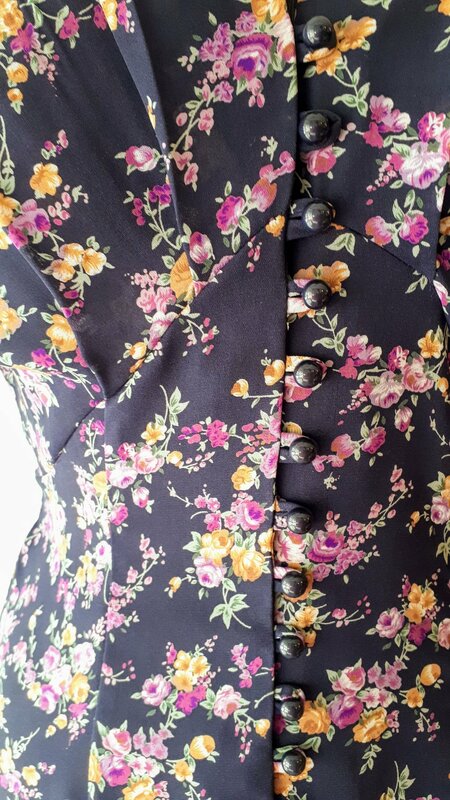 The shape, the pleating across the bust, the puffed sleeves…..
….and the tiny buttons that take forever to do up (90s, I love you, but ever heard of a ZIPPER?!) but they are so cute and earnest in fulfilling their button-destiny! OK, take a deep breath, and let’s go on a magical voyage of handmade dress exploration! First of all, yes, yes we love the classic shape and the colour choices. 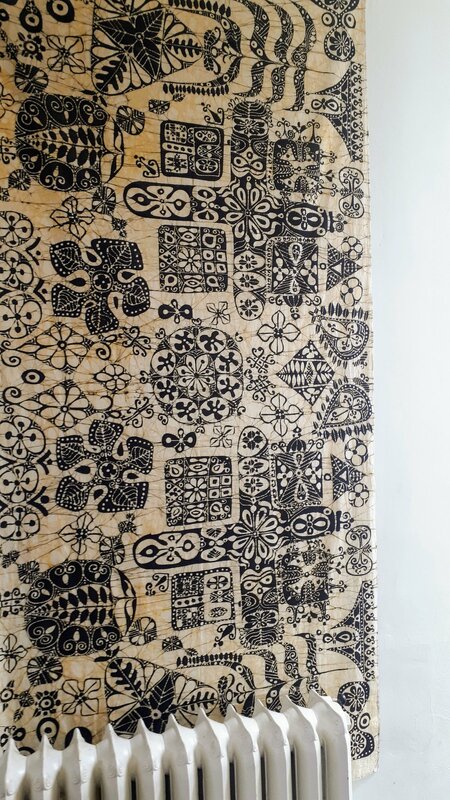 But, when you come to visit this dress in person you will notice that this is batik fabric! Batik fabric is hand-dyed using highly pigmented inks and wax. A good batik will last for years and never fade! Here is the inside of the dress. The pocket here blew my mind, because this would the the “wrong side” of the fabric, yet it is just as vibrant as the “right side” of the material. This shows excellent craftship on the creation of the fabric. And excellent construction on the dress itself! Using my trusty wrist-ruler bracelet (you can get one at The Fibre Nook, btw. I have THREE!) you can see the very generous seam allowance. That signals to me a respect for the fabric and allows for easy alterations. This garment is an AMAZING work of art. Oh, hey, speaking of giraffes…. Ooooooo, friends, I can’t get enough of this one either! It’s like a purse meets a hard shell guitar case! The guy from the guitar store next door to us (I KNOW HIM!) says it’s called “black tolex”. Ooooooooo, and look at the lovely lining! These very special gems are hanging out in the mens section! This week in scarf: silk…. 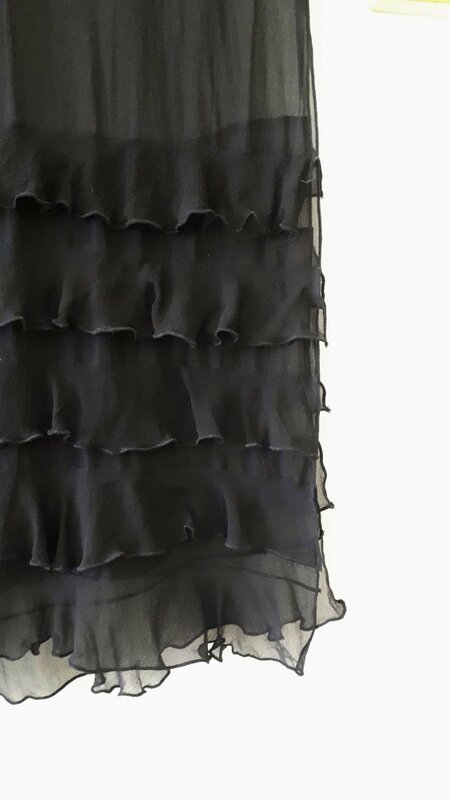 And more silk in the 50% off sales section! Here is the batik that hangs in my house. This beauty is from Benin (but I think it was a gift from a Sri Lankan friend?) where we used to live when I was a kid, and as I am a very old vampire this means it over 200 years old! Kidding, but it’s definitely over 30 years old, and has lived in many countries. It has hung in many places over the years, but look how there is no fading of the ink…. ……even the “wrong side” is still fully pigmented! And I am not above hanging dresses on the wall because art! This is a story for another day! My friend Laura sent me this pic and message. 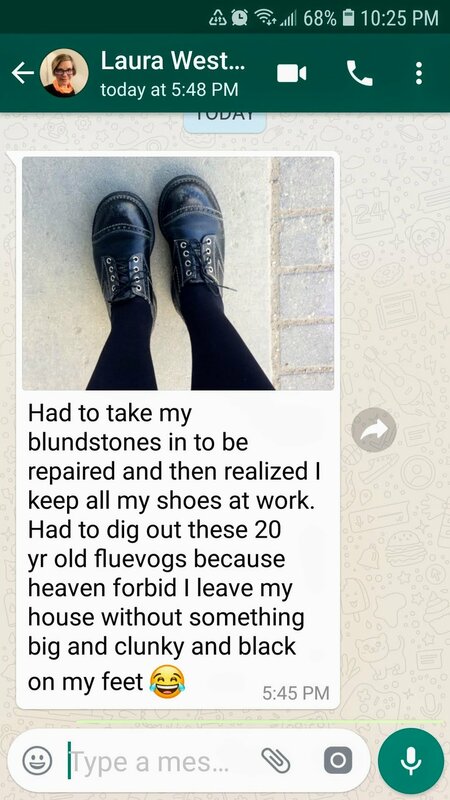 Her Angel Fluevogs still look great, and I am totally pushing her to put these into regular rotation! I’ll be in the shop this Saturday if you want to pop in for a visit; we can catch up and discuss the beauty of hand-made items, the pros and cons of hard-shell guitar cases and purses disguised as books!